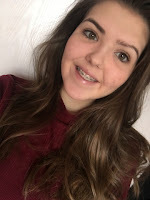 Hello guys, so today I am going to do the Ten Things That Make Me Happy TAG, I've just watched Alyssa Jayne(x)'s video of this on youtube, I will leave the link here (http://youtu.be/LkhOg56v4ms). 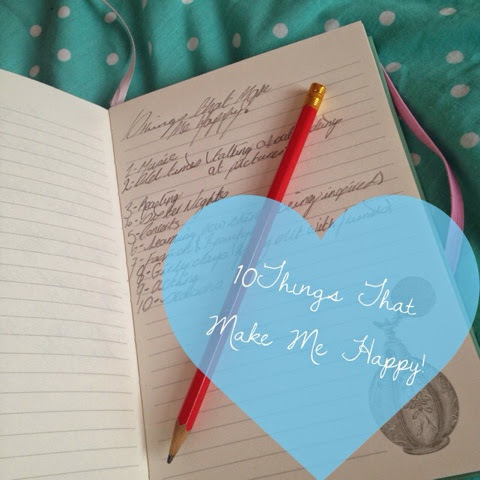 So when I saw this it made me want to do this tag, so I wrote down ten things that make me happy and now I am going to tell you what they are. So first it is music, I adore music and if you know me you will know that whenever I get the chance to listen to music I will. Also I always listen to music, I'm actually listening to music right now, I'm listening to Move My Way by The Vamps. I think makes me happy because what mood you are in there is always a song there that can cheer you up or just sums up your mood. The next thing is old times, so this could be from talking about memories or looking at pictures, they could be from when I was born or memories I have had. But I really enjoy listening to my granparent's tails and what the world was like when they were younger. Today actually me, my mum and my sister were talking about what my sister was like when she was little and my mum, dad and sister and me also talked about what me and my sister use to play in the back garden. It always makes me smile when I talk about old times because all these amazing memories that I might of forgot just comes running back to me. Reading is something I have loved from an early age, when I was younger I use to just go into another room and could sit there for hours and complete a book. But now I love sitting in my room snuggling up in bed with music on reading. I love reading because you just escape from reality and become someone you aren't, you experiences things you will never really do. I love the nights when me and my sister are off and we just sit in our room talking, laughing and being stupid. There is two years between me and my older sister and very close however we don't spend a lot of time together. But some nights when we are off school we put music on full blast, dance around our room, then send ugly snapchats of each other to our friends, sometimes we do crazy makeovers on each other or just sit there and talk about rubbish to each other. It's something I take for granted but I love so much. Concerts are my life full stop. I love them, just the atmosphere there, that everyone is there for the same reason, to see one of their favourite artist and to have a fun time. I've been lucky to have already been to nine concerts and this year I have been to Union J and on Saturday I will be going to see McBUSTED! I have saw so many people I love at concerts, One Direction, Union J, Lawson (ect) and this year I still have three concerts to go (McBUSTED,Little Mix and One Direction) and maybe another one (if I get tickets for The Vamps). Feel like everyone at a concert is just HAPPY! I have put these two together because I feel like when I learn something new or something new about someone I am inspired to do something. I just have a really bad habit of asking a lot of questions and like having answers. I also amazed when people can answer my questions because some are just so bizarre. I feel like because I am growing up I need to have answers to things and the only way I am going to get them is by asking questions. So when ask a question and get a really good answer it just makes me happy that people can take me serious and know I am no joking. Fashion and beauty are just two things I can express myself with. I feel like it is something I can give advice about. I am someone who plans out their outfits, sometimes weeks before I am going out. 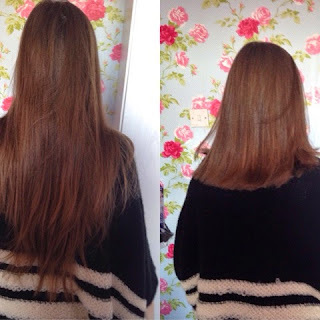 I also class hair under fashion and beauty because it is in a way and hair is something I am good at. I love learning new hairstyles and also trying them out, I am the friend who does everyone's hair if they are having a bad hair day they just ask me to do it. As I was saying beauty and fashion is just thing I love and I didn't like it half blog posts up and I wouldn't have over a thousand views on my blog. So I love going out with my friends, I love going shopping with them, it is two of my favourite things shopping and friends. Me and my friends all have different fashions taste so going shopping with them is so fun because you all express yourselves differently. Also it doesn't have to be shopping and with all girls, the other week it was my friend Amber's birthday and we all went laser quest and there was 7 girls and 2 boys and it was so fun, never did I think I would enjoy it. Then we walked to a restaurant. It was just fun being all together, not in school. It just makes me happy going out with my friends because you can be yourself, and loud and just laugh so much! If there is one thing I love it is acting. I love it so much! I m not that confident and very quiet in school in some lessons, for no reason at all I just am not a loud, confident person in front of strangers and in school. However in drama lessons and the loudest and take charge and make sure people in my group are doing it right and some people are surprised by how confident I am when I act. I also act and do shows for my school with my friends, I have since I was 9 in primary. I never use to want a big talking part however now I love having a talking part, however not the main character. I love acting because you aren't you, you are someone else, and you get into that role. I also like directing people a lot when I do acting just because I like things to look perfect and be perfect. So the final one is most probably the worst but it is season. I love seasons and the way they change. When seasons change so does fashion and because I live in England I feel kind of lucky because you see the change in seasons, like Winter it is cold, like super cold, it's rainy and dark a lot of the time but the comes Spring, nights get longer, the sun comes out and pastle colours arrive. Then there is summer it becomes warm in the uk (what?) and days get longer and you feel refreshed then there is autumn, brown colours and plum come in style (dark colours) and nights get shorter and so do days, the cold comes back and it goes back to winter! I just love how they change so easily and how each one there is something good about them! That is it, hope you like it these were in no order as well! Also I tag all of you who read this to do it, tweet it , put it on ostagram or just comment the ten things that make you happy!